A great low-carb vegetarian recipe to diversify your weekday menu - not only is it a healthy entree but it is also very adaptable. You can add vegetables to your taste. It is ideal for brunch, lunch, and informal gatherings and tastes fantastic. This cheesy meal combines a non-meat protein, vegetables, and healthy herbs and seasoning. It is bursting with flavor, hearty, and sumptuous. 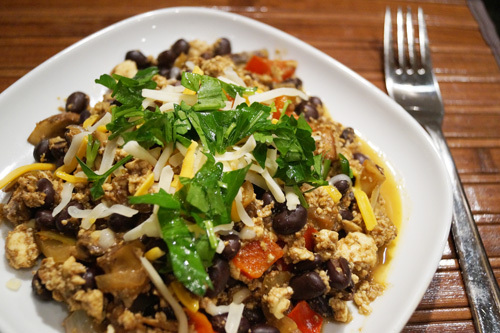 Tofu scramble is a different way to use black beans, bell pepper, and mushrooms. You won't regret if you make a double batch - your family will love it. Use absorbent kitchen paper to absorb liquid in tofu. Then mash the tofu with a masher or fork. Preheat oil in a nonstick skillet, add onion, and cook for 3 - 4 minutes. Or add 1/2 cup of water instead of oil and saute onion for 4 - 5 minutes. Add the mushrooms and red bell pepper and cook for 3 - 4 minutes. Add cumin, coriander, and soy sauce and cook for 1 - 2 minutes. Then add the beans and tofu and stir for 2 - 3 minutes. Season with pepper and garnish with grated cheddar. Sprinkle with chopped fresh cilantro. Serve with arugula or other fresh greens or salsa and low carb-tortillas.